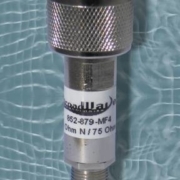 Originally designed for a commercial manufacturer of hardware for communications networks, these conduction-cooled terminations have been deployed in military communication systems; field and laboratory test environments as well as site tower applications. 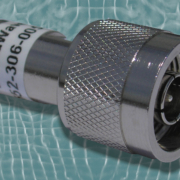 Model 551-199-100 features a SMA male connector and model 551-101-100 features a SMA female connector. 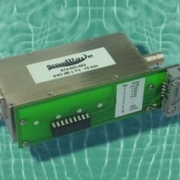 Both devices are space saving 50 Ohm, DC-3 GHz, conduction cooled loads. The terminations mount to a customer provided heat sink; exhibit 1.25:1 maximum VSWR with an operating temperature range of -40℃ to +70℃. Conductive terminations are attractive in applications where space is limited. Typically a traditional 100 Watt finned convection cooled termination is over 6 inches long, 3 inches wide and 3 inches high. 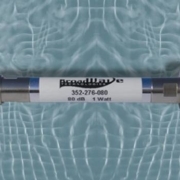 Contrast that to a typical 100 Watt conduction cooled termination that is less than 1.5 inches long, less than 1.5 inches wide and less than 0.75 inches high. Before using a conductive device in an application ambient temperature and available airflow must be considered. The case temperature of these devices must not exceed 100oC otherwise the thick film resistor inside the termination will likely be destroyed. Careful temperature calculations and heat dissipation strategies are a must for successful conductive termination implementation. Often customers have adequate heat sinking available to mount conductive devices and operate them safely. Customers have also used a combination of heat sinking and fans to keep the device case temperature within operating parameters. Always use a thermal conductive compound between the conductive termination and heat sink for best results. Another attractive feature of conductive terminations is their weight. 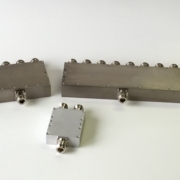 Eliminating the aluminum fin heat sink used to dissipate heat of traditional convection cooled terminations yields significant weight reduction results. 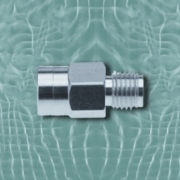 Typically a traditional 100 Watt finned convection cooled termination weighs 2 pounds or more versus a 100-Watt conduction cooled termination that typically weighs 2 ounces. Finally, these lightweight conductive devices play an ergonomic role in the workplace. For example test fixtures that must be manually manipulated by a technician can be made lighter reducing the potential for heavy lifting injuries. A soldier carrying communication or jamming equipment on their back can experience a significantly lighter load reducing the potential for back injuries. Both examples provide a better ergonomic outcome without sacrificing power handling capability. As RF and Microwave technology evolves there will no doubt be continued demand for smaller and lighter equipment. Performance sacrifices in the face of ever shrinking designs are unacceptable. Conductive terminations provide a small piece of the puzzle to achieve scalable solutions going forward.